Endometriosis is the development of uterine tissue outside the uterus. It is characterised by abdominal pain, heavy periods, and infertility and commonly occurs in women between the age group of 25 and 40. The good news is that the condition can be well managed by altering certain aspects of your lifestyle and ensuring you get the proper nutrition. There are a wide range of nutrients to help balance hormones and reduce the estrogen levels in the body, decrease cramping and inflammation, and improve physical and mental well-being. The foods listed below provide the necessary nutrients to produce these effects. 1. Whole grains are excellent sources of many nutrients, including vitamin E and the B-group vitamins, which are critical for balancing hormones and lowering estrogen levels. 2. Vitamin C-rich vegetables and soy beans helps reduce heavy menstrual bleeding by strengthening capillaries and regulating estrogen levels. 3. Fruits contain a wide range of nutrients that reduce menstrual cramps, including vitamin C and bioflavonoids. 4. Seeds and nuts are wonderful sources of essential fatty acids. 5. Fish contains linolenic acid and is an excellent source of minerals, especially iodine and potassium. Salmon, tuna, mackerel, and trout are especially beneficial. 6. Oils that contain vitamin E are good because it helps balance mood and ease fatigue and cramps that occur at the onset of menstruation for women with fibroids or endometriosis. 1. 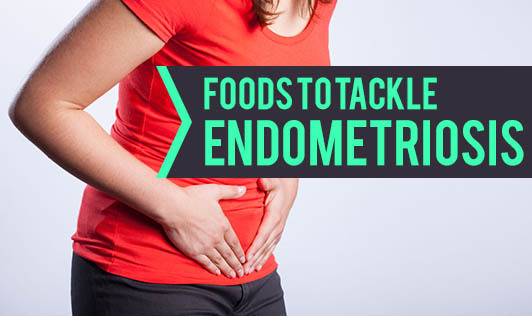 Saturated fats contain arachidonic acid that stimulates the production of muscle-producing prostaglandins that increase pelvic pain and inflammation characteristic of endometriosis. 2. Dairy products such as yogurt, milk, cheese, and cottage cheese are the main dietary sources of arachidonic acid. Limit the intake of these products. 3. Too much salt increases bloating and fluid retention. 4. Sugar depletes the body of B vitamins and minerals. This can worsen muscle tension, irritability, and anxiety. 5. Alcohol stresses the liver and can affect its ability to metabolize hormones efficiently.